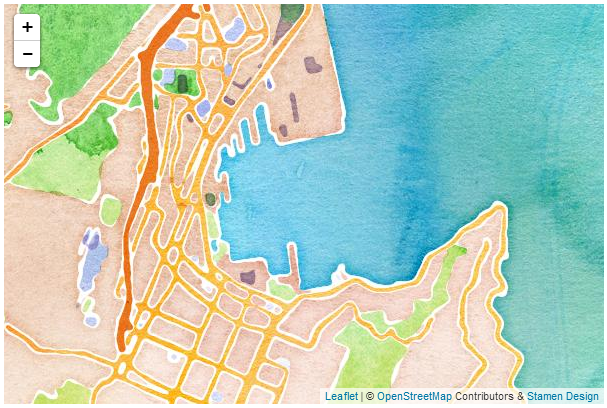 The ‘Stamen.Watercolor’ tiles are a beautiful watercolor themed series of maps based on (I believe) OpenStreetMap data. The tiles are distributed by the good folks at Stamen who also support a mapping solution / thingy called Map Stack and do some astonishing design work. I couldn’t locate any official guidance on usage, so I’m going to make the assumption that any use should fall into the ‘reasonable’ category and advise that if you are thinking of using their maps for anything remotely ‘substantial’ or commercial that you contact them. If using the Stamen.Watercolor tiles, appropriate copyright attribution is required to OpenStreetMap. Additionally in spite of not finding any official guidance on their web site, it would seem appropriate (at a minimum) that recognition of the source as ‘Stamen Design’ with a link would be required. Again, if you are considering using their tiles for any kind of commercial project, you should contact them.